Ahh…Kohler. One of my favorite places on God’s green Earth. Herb Kohler is the man. For those of you who don’t know, Kohler, Wisconsin is a small town about 40 minutes north of Milwaukee. It’s home of the Kohler Co., the kitchen and bath fixture company. Every building in the area has the name Kohler attached to it. Kohler is also home of the American Club, one of the nicest resorts around. And most importantly, Kohler owns and operates four of the premiere public golf courses in the country, including the Straits Course at Whistling Straits, host of the 2004, 2010 and 2015 PGA Championships and the 2020 Ryder Cup (yes, they feel the need to name these things 15 years in advance). 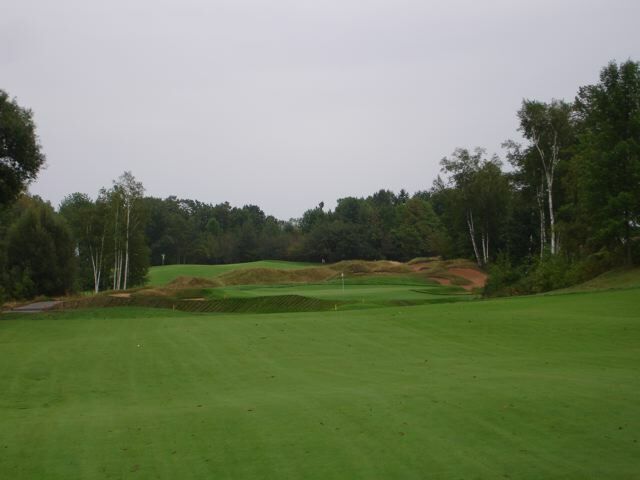 The first course out at Kohler was Blackwolf Run, which was built in the late 80’s and was later split into two courses, Meadow Valleys and the River course. The River Course is one of the best plots of land for a golf course, with big elevation changes and the Sheboygan River winding like a snake through most of the holes. Meadow Valleys is a little more open and user friendly, but the holes that were part of the original 18 are amazing (when Blackwolf Run hosted the US Womens Open in 1999, they used the original layout). The River Course is probably the one course in the U.S. that I could play for the rest of my life and never get bored, it’s that good. I prefer it to the Straits course. My love affair with ‘the Wolf’ started in 1996, when I was fresh out of school and Jefe and I headed up for a day of 36 at what was then Kohler’s only two courses. And we’ve been going up there just about every other year on average until the prices went through the roof and pretty much priced us out of the market. We were there the first month that the Straits course opened in 1998 and again not long after the Irish opened in 2000. Including yesterday, I’ve played a total of 17 rounds on the 4 courses: 6 on Meadows, 6 on River, 3 on Irish and 2 on Straits. Now, if Jefe’s brother Jimbo is the President of the Pacific Dunes fan club, Jefe would easily be the President of the Blackwolf Run fan club. As Vice President, I can serve in both camps. Each of the holes out there has a name, which generally is pretty hokey unless you have a course that backs it up. Jefe and I generally don’t even talk about the holes like ‘Meadow Valleys #15’, ‘River #9’ or ‘River #16’, we just refer to them as ‘Mercy’, ‘Cathedral Spires’, or ‘Unter Der Linden’. Most of the names just seem to fit the holes well, really showing the character of the course. It’s to the point that I could utter nothing but ‘Maple Syrup’ to Jefe in the middle of something unrelated, and he would instantly know what I was talking about, quickly pulling out every shot he ever played on that hole (Meadow Valleys #17) from his memory banks. If that’s not the sign of a good course, I don’t know what is. To get the juices flowing for the trip, I had a little side project for Jefe and I to prepare for…coming up with a compilation course of 18 holes from the 4 Kohler courses, choosing the best 1st hole, 2nd hole, etc. A nice topic of discussion for the 2 1/2 hour trip on the way up…more on the results later. As I mentioned, the prices at Kohler have gone through the roof, especially since the Straits course opened. A round at the Straits will cost you $325 with caddie, not including tip. River is $214 with cart. It was never cheap, but it has forced budget-minded golfers like myself pretty much out of the market. Thankfully, they do have some deals from time to time. In 2004, they had a 4th of July special and Jefe and I jumped at the opportunity to play Meadow Valleys and the River course in one day. And about two weeks ago, Jefe was sent an e-mail with a 2-for-1 offer during the week on Meadows or Irish, the two ‘lesser’ courses. We were originally slated to play a new course in Wisconsin called Erin Hills, a course that is already getting US Open buzz, on Saturday Aug 26th, but we scrapped plans to play there and opted for 36 at Kohler on Monday Aug 28th for $10 less. What a bargain! 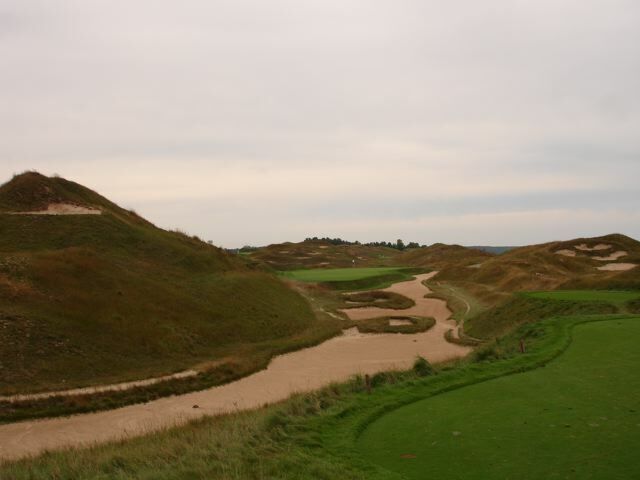 Erin Hills can wait until next year (we had been thinking of postponing regardless because the initial feedback is the conditioning of the course is rough in spots, almost as if they opened the course too soon). 3:45 AM: Scheduled departure time to make our 7:00 AM tee time. The only thing that could get me up this early is golf. I set my alarm at 3:30 and as soon as it went off I was up immediately and getting ready. Good luck getting me up before 6:30 any other day. Would you get up before 4:00 AM, drive 2 ½ hours and walk 36 holes in one day? Jefe and I discussed this and decided that his brother and my wife (which is one of the primary reasons I married her) were the only ones we knew that would do this, albeit reluctantly. If you answered ‘Yes’ to this question, you are instantly my friend. 5:58 AM: First primal wolf howl of the trip, by Jefe. The first official sign that you are getting close to Blackwolf Run. Lame, I know. But that’s the effect that this place has us. 6:14 AM: Second primal wolf howl of the trip, by Jim as we enter the gates of the course. I couldn’t help myself. We haven’t changed in ten years. We eschew the bag drop (a Colton/Tang tradition going 8 years strong) and head straight for the parking lot. Get checked in and head for the range, which as a rare treat was on the opposite end of the range…unchartered territory. Pretty quaint over there with just a handful of bays and a giant tree in the middle of the teeing area. They have the little mini-golf bags stocked with range balls and tables set up with towels, sunblock and little copper kettles with free tees…a nice touch. Jefe and I obviously jump at the chance to abuse the system by grabbing gobs of tees before heading out (and then some more at the starter’s house). It quickly becomes a contest to see who can gather the most tees. I think the four I grab off the cart we borrowed to get to the range put me over the top. I fully expected Jefe to grab the kettle, open up a zipper on his bag and dump them all in. 6:50 AM: Head back to the clubhouse, meet up with our playing partners John (Jeff’s former boss) and Jerry (John’s buddy), who had just arrived with only about two hours sleep. They opt for getting a caddie, who lugged both of their bags. Jeff and I hoof it on our own, but it’s about a mile and a half to the first tee so we bring the cart over there and drop it off. 6:58 AM: Starter begins his spiel about being ‘his’ most important group on the course…the pacesetters. I tune him out because I’ve heard the same spiel hundreds of times before. 7:00 AM: We’re off. Jefe finds fairway. I hit a good drive that goes through the fairway and into the fairway bunker. Breakfast ball…same result. Oh well. 7:12 AM: First triple bogey, by Jefe on the first hole. “Welcome to Kohler, Mr. Tang. Sincerely yours, Pete Dye” (Note: this is about an hour after Jefe’s personal mandate that he has to avoid making the big numbers). Somehow, I manage to get off to a good start, parring the first three holes including a nifty up and down on the par 3 3rd hole. Then I birdie the par 5 4th hole to get into red numbers. Nice. Follow it up with routine pars on 5-7, missing a short birdie putt on #7 after being right in front of the green in two. I wish I had the putt back because I promptly hit in the water on the par 3 8th and make double. And it’s looking pretty grim after I hit in the large fairway bunker on #9, then hit the lip with my approach shot which sends the ball into the water again. But I somehow manage to get up n down with a nice wedge shot from 130 yards out and a 10-foot save for a bogey that felt like a birdie. Solid 38. Jefe bookends his triple on the 1st hole with a matching one on the 9th for a disappointing 45. 9:18 AM: First brat of the day, consumed by Jim. I half-jokingly ask the halfway-house girl if she had any brats ready and she answers with a ‘Yes’ that is more like ‘of course’, so how could I possibly pass? I guess this is how they roll in Wisconsin. Brats for breakfast. Of course, I’ve been up for almost six hours already so this might qualify for lunch. Quality brat regardless. 9:20 AM: First tee shot of the back nine, on ‘Quiver’, a ridiculously tight par four. I’ve played the course five time previously and I don’t think I’ve been anywhere other than in the trees. I manage to find the fairway. Hallelujah! Jefe too. This must be some kind of miracle. We both make par…my birdie putt from about 45-feet just lips out. I won’t complain about making 4 here. I bounce back nicely on the 11th by successfully playing up the rough on the adjoining 16th hole (not intentional), hitting my second shot close to the green and almost chipping in before settling for a 3-foot birdie putt to get it back to one over. 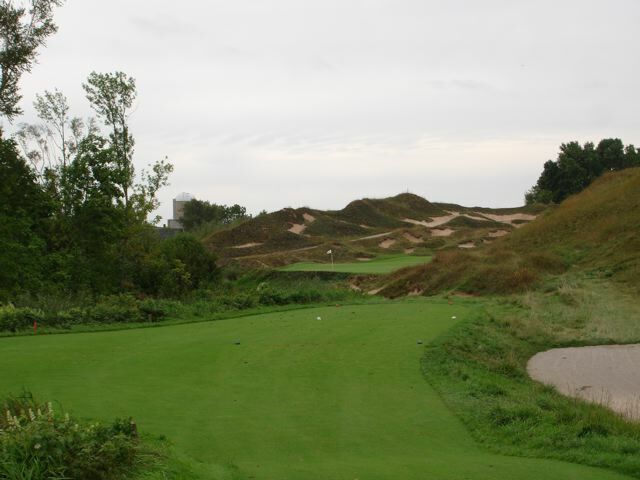 On #12, I have another great save after driving in the fairway bunker and being unable to advance the ball very far. Looking good…until the tough stretch of holes 13-15. I make a dumb bogey on #13 from the middle of the fairway with wedge in my hands, then make triple on the extremely tricky but awesome 14th hole, then fail to get up and down from just off the fringe on the brutal par 3 15th. From one over to six over in a flash. The dream is dead. And it’s starting to look like I might not even break 80, as I hack and slash my way up the par 5 16th, but I hole a crucial downhill double breaking 25-footer for par to keep hope alive. I get through #17 with a pretty routine par, so breaking 80 looks pretty good as long as I don’t completely screw up 18. The 18th at Meadow Valleys is a sweet hole that has the river running down the right side of the fairway before crossing in front of an uphill green framed by large trees. It’s 395 yards but plays longer because you have to lay-up off the tee. I hit a nice hybrid off the tee, leaving me with about 175 yards to a back pin placement. It’s all or nothing. I smoke a beautiful looking 7-iron that draws in towards the flag, landing about pin high about 15-feet left of the stick. Yes! 11:35 AM: I roll in the birdie putt for a 38-39 77. What a great hole to birdie. This one’s going into the memory banks for good. I’m just thrilled to have bounced back from what looked like it was going to be a monumental collapse. Jefe plays a little better on the back but ends up with a 45-44 89. It seemed like he was going to get it going on the par train on multiple occasions but a couple wayward shots and the inability to scramble (normally his strong suit) derailed him. Although it gets much less pub than its highly touted sister, Meadow Valleys is an excellent golf course. It seems to be improving with age as well, growing in and getting some serious teeth. It’s probably the most forgiving course of the four, but that’s not saying much. The course rating from the back is still 74.6. The course was in absolutely immaculate shape when we played it – the greens were some of the smoothest and purest greens that I’ve ever played. It’s a travesty that Meadow Valleys fell off of Golf Magazine’s recent Top 100 Courses You Can Play (it was #56 two years ago). I’ve played enough golf to know a top 100 course when I see one…and Meadow Valleys qualifies. I demand a recount! 11:50 AM: We’re in the car and on the way up to Whistling Straits, which is about 10 minutes northeast of Kohler. I keep myself preoccupied copying the scorecard so we end up taking the scenic route to get there. No u-turns needed though…probably our first road trip without one in a long, long time. 12:15 PM: Check-in with plenty of time to grab a bite to eat, do a little shopping and hit a few putts before a teeing off at 12:50. At the front desk, they have shiny new yardage books for both the Irish and Straits courses. In 2002, the last time I played the Irish, I ended up shelling out $50 buying the old versions of the yardage books for Jefe and me at $12.50 a pop. The old yardage books are as voluminous as they were useless, just humungous spiral bound things that had two overhead views of each hole yet provided very little information. Seriously, you needed to adjust your swing accordingly if you carried one of these things in your back pocket. They must’ve heard the negative feedback because the new ones are absolutely fantastic, probably the best yardage book I’ve seen…and a relative bargain at only $10 each. I ask the attendant if I can trade a new one for this old behemoth that I slapped on the counter, but no dice. However, they did treat Jefe’s like it was some kind of ancient artifact. 12:25 PM: Second brat of the day. Very good. Although they have a little outdoor grilled area that was serving up freshly grilled burgers, chicken breasts and DOUBLE brats. That’s twice the brat! Unfortunately, I didn’t notice it in time. Maybe for dinner. 12:45 PM: We’re off to play the Irish Course. For some maintenance related issue, they have us teeing off on the back nine first, so we have to take a shuttle over to #10 although it’s not that far away. 12:46 PM: John claims that he likes Meadow Valleys even better than the River Course, and Jefe and I instantly jump all over it. ‘No way!’ Jefe screams. ‘Blasphemer! Blasphemer!’ I yell. Even John’s buddy Jerry turned on him. It was eerily similar to when my father-in-law Ken claimed that he liked Bandon Dunes best out of the three courses in Oregon, and Jimbo and I beat him to a bloody pulp. 12:50 PM: We’re off for round no. 2. After grabbing some more tees, Jefe belts one down the fairway to get off the good start. It’s a slight dogleg left so I ask him if I should try to hit a (dreaded, low probability and generally disastrous) fade. He advises against it but I try anyways, launching one about 310 down the left side of the fairway. No breakfast…or lunch ball needed. First, you need to understand that the Irish course and I have some history. I’ve played it twice before, and to say that the Irish course ‘owned’ me would a major understatement. My two previous scores: 86, 84. Ugh. One more less-than stellar round and I would’ve been resigned to the fact that it was just one of those courses that I could never play well. It’s probably the toughest of the four courses out there, just because of the quirks and tricks that Pete Dye put out there. To compensate for the lack of Lake Michigan frontage, Petey pulled out all the stops. He even admits to using every trick in the book on the Irish. If you veer even slightly from the beaten path, the Irish will jump up and bite you (just ask Jefe, who ended up going 43-45 88). So with that as our backdrop, I head down the 10th fairway with hopes of redemption but only mildly optimistic about posting a decent score. But I'm off to a good start on #10, only about 110 yards and a lob wedge left to an uphill green. I hit my approach shot a little phat, but it makes it to the front of the green. Jefe is kind enough to give me a 'DiMarco', which is particularly nice in this instance since the putt is up then down this huge mound. Jefe runs his lag about 12 feet past the hole, so I play it conservatively with about 5 feet of break and it ends up within tap-in range. Number 11 is a long par 3 surrounded by trouble and I smoke a 5-iron right at the flag and it ends up about 10 feet past the hole. Man, I've been hitting my long irons and mid-irons well. Roll that bad boy in to get it to red numbers again. Always good to get off the birdie schnide early. I get the monkey off my back and it frees me up to make more. Usually if I go deep in the round without making one, I start to press a little bit, which is never a good thing. Recently I've been hitting the ball great and putting terribly, which has been extremely frustrating from a scoring perspective. On number 12, Jefe takes the scenic route to the green, driving right and caroming off the cart path to give himself an opportunity to hit at least one shot off the Straits course which is right on the other side of the mounds here (the 14th and 15th holes). 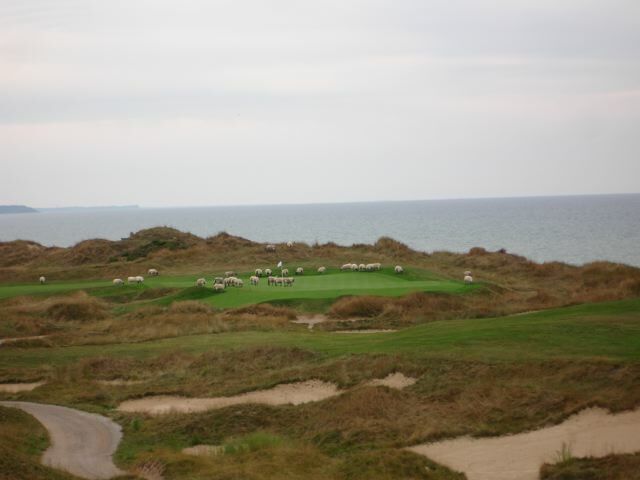 I'm glad he did because we got to see the black sheep that graze the property...they've all convened around the 14th green. Check out the picture below. I don't know what you'd do if there were a bunch of sheep blocking your hole. Do you just soldier on? Can I get a ruling? Meanwhile, I keep up my solid play with fairways and greens, fairways and greens. Again, a lot of missed birdie opportunities. I miss 10-footers on #13, #14 and an excruciatingly painful 4-footer on #15 after a beautiful approach that dances around the cup. That hurts. On #16, I make my first mistake of the round, leaving my approach too far left and it stays up on this mound instead of catching the slope and feeding towards the hole. Bogey...back to even. I finish #17 & #18 with routine pars for a solid 36. 8/9 Greens in regulation. 6/7 fairways hit. Numerous birdie opps. I'm not complaining. One thing about the 18th...I love Pete Dye but this has to be one of his worst designed holes. It's a 550 yard par 5 with little or no risk or reward aspects. I hit a monster drive about 300 yards only to be left with the prospect of having zero chance of reaching the extremely uphill plateau green. There's a creek that winds across the fairway around 75-100 yards out. Across the creek is a huge uphill slope with basically no flat spots. Come up short and you're probably going to roll back to the 75 yard mark again. And you don't want to be hitting a 3/4 wedge to this green either. Staying short of the creek is no bargain because there is just a sliver of fairway that winds in front of the creek. I had nearly every club other than putter and driver in my hands at some point trying to figure out where to hit my second shot. Finally I decided on hitting SAND WEDGE to lay-up short of the creek, leaving LOB WEDGE for the third shot. Driver...Sand Wedge...Lob Wedge. Not much risk-reward there. Not much fun either. 3:30 PM: (Yes, 2:40 minutes later) We take the shuttle over to the front nine, where it's fortunately more of the same for me. I'm hitting the ball a long way off the tee and it's setting up no more than pitching wedge into the greens. I hit gap wedge to about 15 feet on #1, ram it past the break but made the 3 1/2 footer coming back. Flirt with the water off the tee on #2 with a 3-iron, but this leaves only lob wedge to the green and I hit it to 15 feet again. Downhill putt that looks like it's going to roll forever but I somehow manage to leave about 4 inches short. Then on #3, a short par 3 that I'm 0-for-2 lifetime in hitting the green, I hit gap wedge to about 20 feet. Jerry manages to saves par with a 40-foot bomb that went up and down a giant ridge, with bonus points for his creative commentary before, during and after the stroke. Then I proceed to follow his lead by holing out for birdie (with equally creative commentary and a Tiger Woods-inspired haymaker). Back in red numbers! Good times. #4 is a tough 450 yard dogleg par 4 and I hit a decent drive but it's still about 180 yards out. I hit 6-iron a little fat and it ends up short of the green close to the bunker. Jefe and I are a little stunned because it's the first mishit I've had in awhile. I have a tricky little up and down put I play a mini flop shot that scoots by the hole and ends up about 4 feet past. Huge, huge putt here to keep this party going. It's amazing what a big up and down can do for a round. 4 feet feels like 10 feet but I manage to hole it out center cut. Keep the dream alive! So I'm feeling good about the big par save and get up and rip it on the par 5 5th. I take the aggressive line that shortens the hole tremendously. I have 201 to a tucked right pin and I hit 5-iron towards the center of the green the checks up about 25 feet from the hole. Eagle putt! For some reason this green is sanded over...that's not cool. I line it up, say my prayers, but it slides just by on the left. Tap-in birdie. Two under, four holes left. Yikes! The sixth is another short par 3 and I hit gap wedge again...right over the flag. Jefe provides the commentary: 'Radar. Locked and Loaded'. It looks closer but is actually about 15 feet past the hole. My birdie putt slides by right for a tap-in par. Still two under, only three holes left. I'm feeling pretty good right now. Not too worried about falling apart like at Prairie Landing (see my Diary of a Golfer here) a month ago, where I was 4-under through 10 holes and missed a 6-footer on the last to shoot 72. Things are looking promising because 7 is pretty short, 8 is a par 5 and 9 is probably just a wedge if you hit a good drive. But I'm trying not to get too far ahead of myself. I hit 3-iron off the tee but it ends up left and gets hung up on the lip of one of Pete Dye's 1,100 bunkers (call it bunker #894). I hack my way out w/ 8-iron but it's still 80 yards from the hole. Unfortunately, no up and down magic here. Bogeyville. And #8 isn't much better. Maybe I am feeling a little tight under the collar. I yank my drive right and it ends up in the tall grass. I try to punch a 9-iron over to the 9th fairway, but it's in the rough and I can't really see the green or tell how far away it is. I opt for 9-iron but it's short and left. Bogey. Back to even. Thankfully, I manage to bounce back and rip one about 300 on #9. Only 80 yards left and I hit lob wedge to about 15 feet. He's got a chance!!! But the putt slides by left, but a simple tap in for a 36-36 72. Not my best golf score ever, but easily my best round of golf ever (confirmed by Jefe). 14 Greenies. 10/14 fairways. And the smooth, sweet taste of vindication! Jefe understands the struggle, the journey and the gravity of the situation and we awkwardly embrace like Tiger and Stevie (without the tears...but it was getting misty). All is good in the world. This round was also validation of everything that I've been trying to accomplish this golf season. Validation that the round at Prairie Landing wasn't a fluke. Validation that I still need to work on closing out a round when I'm under par. But I fully expect that it's going to happen with increased regularity, and soon I won't have to bore you with all of the details when it does. Two weeks ago I was ready to hang em up after a horrible two-week period of rounds in the low-to-mid 80's, capped off with an agonizing 82-83 in the Prairie Landing Club Championships. Then something snapped and I've been playing extremely well since. My last six rounds: 75-76-75-76-77-72, all with little to no contribution from the short game. This is literally the best ballstriking period of my life. Could be a fluke, but I hope it's a trend. And I can't really pinpoint any one cause for this dramatic turnaround, but I have a few theories. First, I bought a Medicus training aid (the one with the hinge in it that collapses when you're off plane or take it back too quickly). Normally I'm not too into training aids but I got paired up with some guys who swore by and I was desperate for something to get me back on track. Seems to work...best $80 I ever spent on ebay. Also, seeing Tiger win a major in person (see my blog from Sunday at Medinah here) had at least some effect on me. Seeing him so focused and so committed on every shot, despite all of the hoopla surrounding him and the magnitude of the event is what really impressed me the most. Tiger probably has more talented playing left-handed than I do, but there's definitely one aspect that I could try to mimic. John commented that I was just going about my business, to the point that he was dying to get at least one sign of approval from me. My telling him 'nice roll' on a quality lag putt pretty much made his day. On the evening before we left, I got the opportunity to take my son Jordan out to play a quick nine holes after dinner. What a blast! Jordan rode along in the cart, chipped a little, putted on every hole, watched me through my laser range finder, walked through numerous bunkers and even mimicked the Sergio jump from the 1999 PGA Championship. He even played his first real hole from beginning to end, scoring an 11 on the 14th at Prairie Landing, a short par 3 from the forward tees. Pretty good for a 4 year old! Watch out Tiger. Two things I learned from Jordan that evening. First of all, it just renewed everything I love about the game in getting to share it with my son. At the end of the day, you should be having fun (as most golfers can attest, this is easier said than done.) And second, I learned that playing with a four year old is probably the best way to build some mental fortitude. Try making a solid stroke with a toddler yelling, 'Look Daddy! An airplane!!!' in the middle of your backswing. I played the ten holes with Jordan even par. So thank you Jordan. Thank you Tiger. Thank you Mr. Medicus. Thank you Herb Kohler. And thank you to Jefe's chiropractor. This round's for you. I could've easily gone with any of the holes that Jefe chose instead of mine, and I seriously considered using his choices for #9, #10, #11 and #18. But I'm pretty happy with how mine turned out. I did throw the Irish course a bone by having at least one hole from that course. Jefe didn't have any. The Irish a solid course, but hole-by-hole it has a hard time stacking up to its big sister. Because Jefe says I always take everything a step too far (which is true), I created a layout for my course as well. How would you like to play this course?